Shalini had a complicated relationship with her mother. When she dies, Shalini is devastated and angry. Uncertain about what to do next, she decides to travel to Kashmir to track down Bashir Ahmed. Ahmed was a traveling salesman whose visits seemed to bring her mother rare moments of happiness. But the towns and villages of Kashmir are very different from her privileged upbringing in Bangalore. 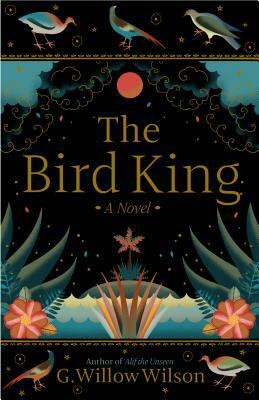 Shalini doesn't know if she wants to be involved in the complicated relationships and secrets that permeate the Ahmed home, but she may not have a choice. It is almost difficult to write about The Far Field, because it encompasses so many things. It's a story about the shift from naive childhood to adulthood, about grief and finding the edges of your knowledge of someone you loved and lost. It's a story about privilege and poverty and politics, and realizing that you know so little about the world around you. In the opening pages, Shalini tells readers that "I am thirty years old and that is nothing." 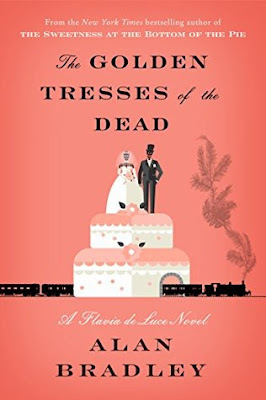 After that, the book moves in parallel timelines, as she remembers growing up with her unpredictable, vibrant, sometimes cruel mother, and tries to learn more about her mother and herself in the present. The book is beautifully written. It's hard to believe that this novel is Madhuri Vijay's debut, because she reveals human emotion and failing so well, while simultaneously making you feel that you are really walking narrow mountain pathways or wandering through the streets of Bangalore. 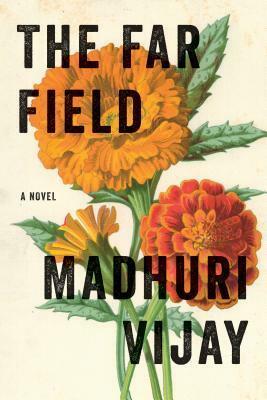 The Far Field is an intimate and sprawling story at the same time, as Shalini comes to terms with the loss of her mother and learns what her place is in a tumultuous, uncertain world. This is what my bedside table has looked like for the past few weeks. I think I now own partial stock in Kleenex, my husband and I are familiar to all the late-night cashiers at the local pharmacies, and I have had my first chest x-ray and inhaler. When we are in our most hectic days, having a few days to sit in bed and read sounds pretty nice. But in my experience, it doesn't really work that way. The kids are sick when you are, so there is less time spent resting in your own bed and more time spent checking temperatures and rocking them back to sleep. Instead of reading through a glorious pile of books during your sick days, it's much more likely you fall asleep in the middle of a page and then wake up to cough all over your book. But all hope is not lost! Just because someone in your house has been sick for the last five weeks doesn't mean that you can't do any reading at all. 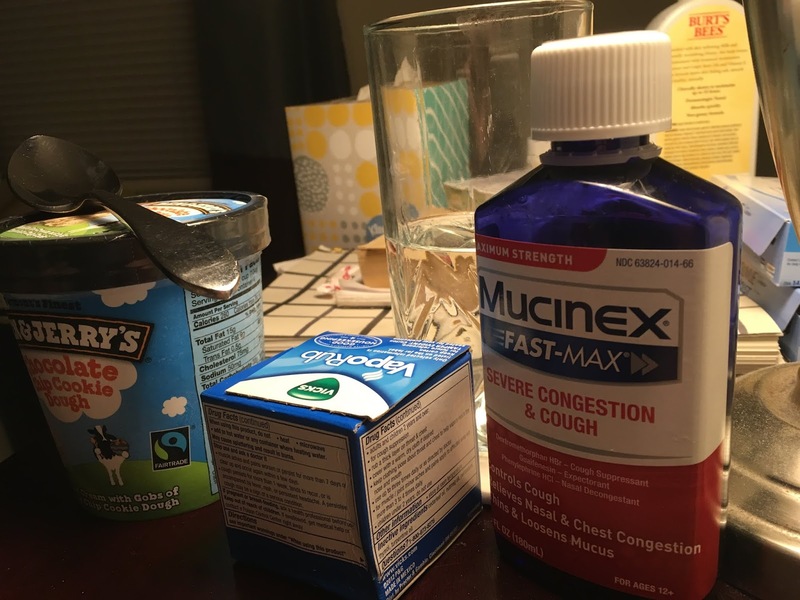 Here are my tried and true tricks for reading when you and everyone you know has fallen victim to the flu/cold/stomach bug. I know, that giant biography looks really interesting, but you probably can't hack it. I certainly couldn't focus on the intricacies of Benjamin Dweyer's grammar guide or the ins and outs of paleontology in The Dinosaur Artist while I was hacking up a lung. Just put it aside--it will still be there when you feel better. Sick days are the perfect time to tackle the novellas or short stories you've been meaning to read. If you have twenty minutes of attention before the cough medicine kicks in, that's a whole story down! I finally read the first of the Murderbot Diaries while I was sick this time and it was perfect. Now is not the moment to start the new series you keep hearing about or finally learn about quantum physics. Sick reading is the time to stay familiar, with characters, authors, and stories you already know. This is your moment to pick up a sequel, re-read a favorite story, or let your inner fan out. Personally, I read Leia, Princess of Alderaan, which was perfect because I already knew some of the characters but I also learned more about our favorite princess/general. Being sick is the worst. Don't beat yourself up if your reading falls by the wayside, just like the stack of mail on the table and the dishes in the sink. The books will be waiting for you when you're finally germ-free. Clearing, Oregon is a typical kind of town. Ginny and Mark are a couple trying to find time for their marriage in between raising their son and their busy careers as a surgeon and a biologist. Down the street, Samara mourns the death of her mother and wonders if she should go back to her old life or follow in her mother's footsteps. Cass rocks her baby to sleep and wonders when she will have the time or mental strength to get back to work on her PhD. One ordinary day, each of the neighbors sees a vision of life as it might be: a life where they are married to different people, where a deceased parent is still alive, where they have a second baby, or a life where a terrible catastrophe destroys their neighborhood and impacts everyone who lives there. What are these visions? Are they seeing possible futures or whimsical dreams of what could be? Will their actions prevent these events or make them reality? If, Then is a story that can be classified as sci-fi or magical realism, but it focuses not on the how or why of these visions, but their impact on the people who have them. In fact, it is sometimes difficult to tell which version is real and which is a possible version of events. 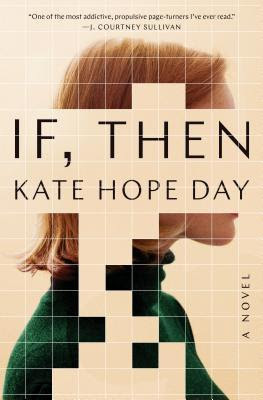 It is an inescapable part of life to wonder how our lives would be different if we had made different choices and Kate Hope Day lovingly renders the pain and the potential of these musings. But this isn't a book where the plot meanders for the sake of character development; the choices that these characters make change their lives and families in big ways. This is one of those stories where it's easy to convince yourself you will read just a few more pages, only to find that you've been reading for an entire hour. I really enjoyed this debut novel. The author makes the reader really care for each character as we jump from one potential timeline to another, all the while wondering if Ginny, Mark, Samara, and Cass will be able to find fulfillment and happiness. I will certainly be picking up whatever Kate Hope Day writes next. 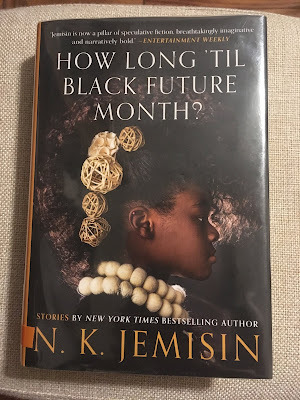 My Favorite Stories from How Long 'Til Black Future Month? Novelist N.K. Jemisin's recent publication of a short story collection made fans of sci-fi writing very excited. I started this collection from a unique perspective: although I've been meaning to read Jemisin's Inheritance and Broken Earth trilogies for a while, this was my first time reading her work. Like most short story collections, some selections resonate more than others. I found it a bit difficult to get into this book because the first story is told in a distinctly distant manner. An unnamed narrator takes the reader through the city of Um-Helat on the Day of Good Birds and shows us all the ways their society is different from ours. But once I started reading the second story, I was pulled right into Jemisin's incredible imagination, the very different worlds she created, and the characters she brought to vivid life. I discovered that the stories I loved best had a historical flair to them as opposed to being set strictly in a future world, but you may fall in love with the tales of a girl whose intelligence means she will be taken from her family or a woman who goes missing on another planet among an alien race with big secrets. Red Dirt Witch is an early story that follows Emmaline and her children in Alabama. Emmaline has a gift for dreaming prophetic dreams, so she knows that the White Lady will be coming to visit them. But she doesn't expect that the woman will demand one of her children in return for safety for the rest as change comes to the South, full of violence and struggle. This one might be perfect for readers who love Neil Gaiman's Ocean at the End of the Lane. L'Alchimista is the story of a grumpy chef in an Italian inn named Franca. After a delicious meal, a stranger offers her an unusual challenge: follow a recipe and make a specific dish using the strange, perhaps impossible, ingredients he has provided. The Effluent Engine is a steampunk story set in New Orleans. Jessaline is determined to find a scientist who can take the waste from rum production and turn it into methane gas, but she didn't expect to have competition or discover that the scientist's beautiful sister can make the theory a reality and steal her heart in the process. Cuisine des Memoires starts off unremarkably, with Yvette inviting her friend Harold to dinner. But Harold soon learns that the Maison Laveau serves very unique meals. In fact, they claim that they can recreate any meal from any place in the world throughout history. When the kitchen serves up the very meal that his ex-girlfriend made for him, Harold is determined to find out how they make this miraculous food. Sinners, Saints, Dragons, and Haints, in the City Beneath the Still Waters is the last story in the collection. The water is rising and the levee is about to break, but Tookie is still in New Orleans. He is going to need the help of a talking lizard and his elderly neighbor Miss Mary to get through the flood and survive whatever is living in the floodwaters. Did you read this story collection? Which one was your favorite? 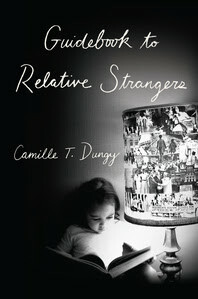 Camille T. Dungy is a poet and professor and her work often takes her to lectures or book signings across the country. After her daughter was born, she realized that it would be easier to take her baby along with her instead of finding care for her when she was gone and her husband was working. As she traveled, she found that people paid attention to a black woman with a baby who stood out in a sea of white people. These essays are her observations about motherhood, writing, nature, travel, and being a black woman and raising her child in a white world. Essay collections like this one can be amazing reading experiences or fall flat. After all, anyone can write about the moments of their lives, but the thing that makes it unforgettable is the author's insight into those moments and the beauty with which they express them. Camille T. Dungy has both of those things, as well as a careful understanding of American history. She opens the book by reflecting on her stay at a writer's colony shortly after she returned home from Ghana and went from being one black woman in a crowd of them to being the only person of color at the retreat, with the expectation that she can and should speak for all black people. She is able to connect seemingly unrelated moments in her own life and in American history in a beautiful and profound way. In one essay, she weaves her memories of growing up and her diagnosis of multiple sclerosis with the implications of Ronald Reagan's election on their community and a visit to a memorial for victims of a lynching. She notes that "When I am writing, it is always about history. What else could I be writing about? History is the synthesis of our lives." One of my favorite pieces is the one where she reveals the reasons behind her daughter's name and nicknames and realizes the impressive gift she has to been given to teach her about words and the world around her. Not content to reflect on her own motherhood, Dungy contrasts it with a group of women who traveled to California and the children they carried and lost along the way. "I don't know if there is a name for this in any language, this hope and hurt and hunger I hold when I hold you." Guidebook to Relative Strangers is a thoughtful, moving, and beautiful book and I'm so glad that I read it.